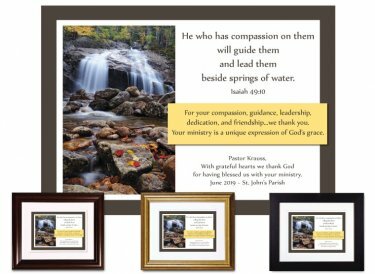 Lovely pastor appreciation keepsake is designed around a beautiful passage from Isaiah: He who has compassion on them will guide them and lead them beside springs of water. Verse detail: For your compassion, guidance, leadership, dedication, and friendship...we thank you. Your ministry is a unique expression of God's grace. You'll personalize it by adding your special message (the four lines shown at the bottom of the example). We have another design based on the same theme. Framed & Finished - Printed on premium paper with archival inks and double-matted with conservation-grade matboard as above; mounted using acid-free foam core backing; framed using distortion-free UV acrylic glazing. A protective dust cover and wall guards are applied to the back. Your choice of walnut or black wood frame (view frames here); ready to hang. Finished size: 10"12"